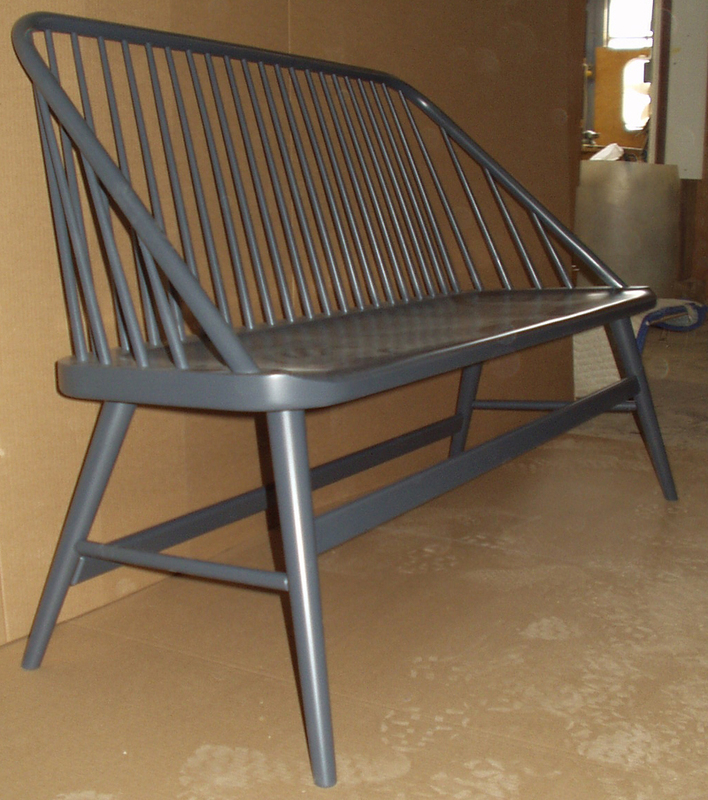 Windsor Bench: This contemporary windsor bench or settee was one of the first items I designed and is inspired by Shaker furniture and by the five plus years I worked at Thos. Moser Cabinetmakers. It is constructed of cherry with ash spindles and maple (often birdseye or tiger maple) legs. I have also made this contemporary windsor bench in maple, walnut, and oak. All but the oak bench had ash spindles and maple legs. The curved “bow” of the back is a laminate because cherry and many other woods do not steam bend well enough to make the tight curves you see. For the cherry benches I buy laminating veneer in flitches; a flitch is a half a log that has been sliced with a knife, in this case to 1/10th inch thick slices. Since the slices come in sequence the grain matches when the bows are glued together and the gluelines seem to disappear. The seats are rough shaped with an electric chainsaw then ground and finally sanded 4 time in sucessively finer grits. Windsor Bench: This contemporary windsor bench or settee was one of the first items I designed and is inspired by Shaker furniture and by the five plus years I worked at Thos. Moser Cabinetmakers. It is constructed of cherry with ash spindles and maple (often birdseye or tiger maple) legs. I have also made this contemporary windsor bench in maple, walnut, and oak. All but the oak bench had ash spindles and maple legs. The curved "bow" of the back is a laminate because cherry and many other woods do not steam bend well enough to make the tight curves you see. For the cherry benches I buy laminating veneer in flitches; a flitch is a half a log that has been sliced with a knife, in this case to 1/10th inch thick slices. Since the slices come in sequence the grain matches when the bows are glued together and the gluelines seem to disappear. The seats are rough shaped with an electric chainsaw then ground and finally sanded 4 time in sucessively finer grits.